Yes, the all-new Tower 2 Annex is an extension of the existing First World Hotel Tower 1 and 2. Although all 3 blocks are linked together, they are currently undergoing a new face-lift and I am surprised that the new concept is totally different from the old blocks! Here's the walkway towards Tower 2A. As I walk into the hotel, I am totally impressed by the contemporary chic setting, feeling as if I am at an upscaled boutique hotel. The lobby is fully equipped with 3D television visuals, chill music and a designer's featured wall. Gone are those days when you have to queue for hours at the counter for hotel check-in. 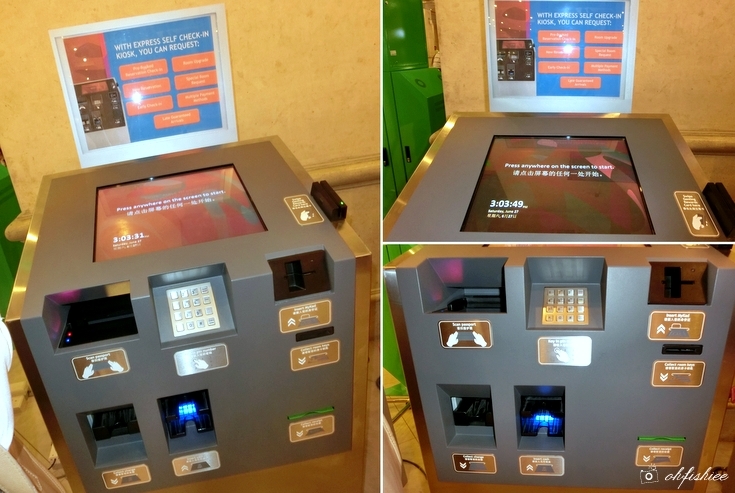 At the lobby, you can find plenty of user-friendly Express Self Check-In Kiosk, where you can check-in using membership cards, MyKad or Passport for prepaid advanced bookings. The efficiency is so amazing that I manage to check-in within 2 minutes! So this is my crib over the weekend. Pretty right? The new rooms are more spacious and well-equipped with full-fledged amenities which make the space more family-friendly especially for travelers with toddlers. Mine has two super single beds, an open hanging cupboard, 32" flat-screen television, telephone, mini fridge, kettle with coffee-making facilities, large laptop-sized in-room safe plus hair dryer, international socket and USB powered Lan access point. You must be wondering if such comfortable room would cost a bomb. Of course not! In fact, First World is the most affordable hotel at Genting yet offers great comfort and functionality at the same time. The rate varies from RM228 to RM461 for XYZ Deluxe room, depending on seasonality. Since I book this for a Saturday night (Peak season), it is RM351 NETT, excluding breakfast. I think the best part is the bathroom, because I love to have plenty of room for changing (and for better privacy if you are sharing the room). 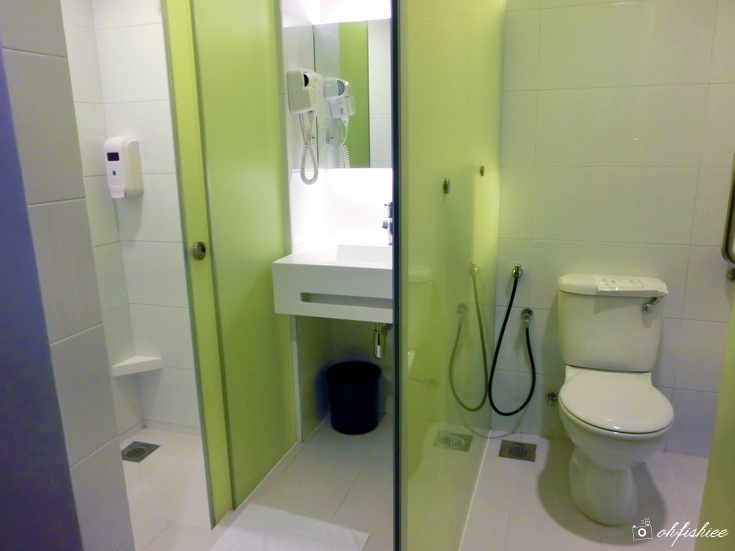 The frosted lime green glass walls separating the shower, sink and toilet area, again, exude modern elegance and style. If you want to have even more space at First World, there is a WorldClub room at Tower 1 which has two queen-sized beds and living hall that is great for bigger groups. On the other hand, the WorldClub room at Tower 2 looks equally spacious but the two beds are of super single size. The superior deluxe room is slightly smaller than WorldClub but is equally recommended for a group of 3, or you can opt for Deluxe Triple Room instead. The theme design is similar to the one I stay but this room offers more space to roam around. Even the lobby area looks warmer and more cozy with kisses of sunshine from the panel windows. .....and the lift! Looks so cool right? When I am lazy to walk to the eateries around First World Plaza and other premises on the highland, the new Terminal 2 Cafe right at the lobby is here to save my day. This chic, open-concept cafe features freshly baked pastries, soups, sandwiches, beverages and more. You can easily grab and go, or take a seat and enjoy the complimentary WiFi from 7.30 in the morning till 12 midnight. Definitely a great choice to kill those late night hunger pangs, without having to walk too far for food. In the next morning, I decide to take a quick walk to the First World Cafe for my buffet breakfast since all 3 towers of First World Hotel are linked. Interestingly, I just go from my room to 8th floor and do a bit of walking to reach the cafe at 3rd Floor of Tower 1, passing by the connecting pathways. Weekend trip to Genting is always short and simple, and I am glad to have a pleasant stay at the new room, away from the scorching heat in KL. Before bidding goodbye, all you need is just to drop the room key cards at the Check-Out E-Kiosk around First World Hotel. 1. It is a satisfying experience at First World Tower 2 Annex XYZ Deluxe room, considering the facilities, space, design and functionality. 2. I personally like the brandnew concept that provides enhanced hotel experience at an affordable rate. 3. Revisit? Yes. A good bargain if I need a chilling escapadee for a day or two. Hahaha Simon, why does this sound like my tagline :P indeed very chio. Let's go! cant wait to pay genting another visit when the theme park is ready! love the rooms too! Hi Sab, :) yup I can't wait for the theme park too! Hi,thanks for the info about the xyz rooms,we gonna stay there this week end april 2016.Friend of mine told me the Fox theme park most likely will be open in end 2016.